But she lingered still, in the world of the living, a haunt barred from the Stone Fields, where the noble dead lie, for a desire so deep death cannot claim her; now, upon the edge of the Wretched Plains her ghost is fearful and restless. Gods are moved by greater things than mortal man. Lonely upon his gilded chair St. Luther, god of Aihrde, Lord of Dreams, King Palatine of Kayomar, father, and husband, sits in restless slumber. He dreams of times long forgotten and people long passed from the world. He knows not that he slumbers, nor that he dreams. He sits, dreaming forgotten dreams, stalking the corridors of his memory, reliving the moments of his life. Forever is it the Malady of Kings that they forget. After his long wars, Saint Luther, Lord of Dreams, retired to the Sea of Dreams where he took up residence in the great Castle Pendegrantz. Here he ruled over the Dreams of mortals, forgetting his own thoughts. His one true love, Queen Vivienne had died. This he knew; but unbeknownst to him her spirit did not pass to the Stone Fields where the good rest forever. Instead it lingered in the world, awaiting his return. She haunts her crypt, looking for him and the ring she gave him, and that he promised to return. Her haunting has left the Lord of Dreams troubled, though he does not know why. His mind is ever wandering, attempting to grasp that troubled thought that lies just beyond his vision. The crypt, the Friden Anhohe, is haunted by her ghost. It is up to the characters to find it, discover who or what she is and to free her from her haunted curse. But they are not alone, for an ancient and vile wizard, who wishes to gain access to the Sea of Dreams and to Saint Luther has learned of her fate and wishes to keep her in this role, for it troubles the Lord of Dreams and makes him vulnerable to the wizard's attack. The characters, if they dare take up the mantle of adventure, must take the perilous road that crosses the wilds of the Eldwood, flings them upon the face of the turbulent Sea of Dreams and must at last bring them to the shores of the Isle of Blight where evil has taken root. Here they must solve the riddles of the wizard's sorcery, encounter monsters of epic proportion before ever they come into the presence of Saint Luther, Lord of Dreams. Even then danger awaits them for the Lord's slumber is a perilous thing to disturb. A Note from the Author: "The original d20 version of this adventure was a fun adventure, but it tended to place the emphasis of the story on the demi-gods that peopled the adventure and shift it away from the characters and their actions. This approach does not work in Castles & Crusades and I have modified the adventure accordingly. A new introductory encounter has been added to the advent as well as a drastic alteration in the way the plot unfolds. In all about 15-20000 words have been added, that about 15-20 pages. 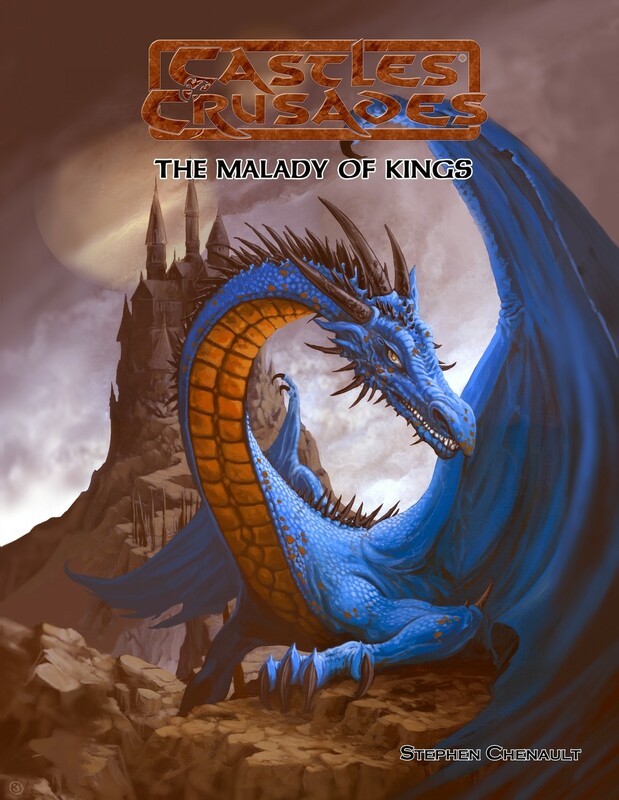 Malady of Kings was one of our best selling d20 adventures, I hope you enjoy this revisiting as much!"